Ellen White (1827-1915): “The divine command was: “Go forward.” They were not to wait until the way was made plain, and they could comprehend the entire plan of their deliverance… He might have saved them in any other way, but He chose this method in order to test their faith and strengthen their trust in Him…The Hebrews were weary and terrified; yet if they had held back when Moses bade them advance, if they had refused to move nearer to the Red Sea, God would never have opened the path for them.…To obey the commandments of God is the only way to obtain His favor. “Go forward” should be the Christian’s watchword” (4T, pp. 25-28, 1881). Daniel March (1816-1909): “The command to “go forward” is the Christian watchword of duty and of safety in all ages… I say, in God’s name, Go forward! Do your duty at whatever cost. Obey the Divine command with a ready mind and cheerful heart… If the Hebrews had not advanced – weary, terrified, afflicted as they were – when Moses gave the word to go forward, we have no reason to suppose that the waters would have divided…” (Night Scenes in the Bible, pp. 141, 142, 1868). Ellen White (1827-1915): “More than eighteen hundred years have passed since the lips of Jesus pronounced those words in the hearing of thousands of thirsty souls; but they are as comforting and cheering to our hearts today, and as full of hope, as to those who accepted them in the Jewish temple” ( 2SP, p. 346, 1877). Daniel March (1816-1909): “Eighteen hundred years have passed away since this cry went forth from the lips of Jesus in the hearing of weary, thirsty, exhausted men, but his words are more full of meaning and power to us to-day than they were to those who heard him speak” (Night Scenes in the Bible, p. 367, 1868). Ellen White (1827-1915): “As Jesus spoke thus to the people, their hearts thrilled with a strange awe, and many were ready to exclaim, with the woman of Samaria, “Give me of this water, that I thirst not.” (2SP, p. 346, 1877). Daniel March (1816-1909): “They felt the strange power, the sacred fascination of the voice which rung out clear and loud on that memorable morning… And some were ready to say, with the woman of Samaria, “Give me of this water that I thirst not” (Night Scenes in the Bible, p. 367, 1868). Ellen White (1827-1915): “They eagerly accepted the light from heaven, as did the first disciples from the lips of Jesus. When those early Christians were exiled to mountains and deserts, when left in dungeons to die with hunger, cold, and torture, when martyrdom seemed the only way out of their distress, they rejoiced that they were counted worthy to suffer for Christ, who was crucified for them. Their worthy example will be a comfort and encouragement to the people of God who will be brought into the time of trouble such as never was” (5T, p. 213, 1889). Daniel March (1816-1909): “The early Christians took this word from the lips of the risen Christ, and they carried it with them wherever they went. When exiled to mountains and deserts, when treated as outcasts and the offscouring of all things, when in left to die of hunger and cold and torture in dungeons, when surrounded by the fires of martyrdom, when cast into the arena to be torn in pieces by wild beasts, they meekly folded their hands upon their breasts and waited for the worst in peace… the early Christians made everything of the resurrection of Jesus” (Night Scenes in the Bible, pp. 425, 426, 1868). Ellen White (1827-1915): “There are deep mysteries in the word of God, which will never be discovered by minds that are unaided by the Spirit of God. There are also unsearchable mysteries in the plan of redemption, which finite minds can never comprehend… God’s providence is a continual school, in which He is ever leading men to see the true aims of life. None are too young, and none too old, to learn in this school by paying diligent heed to the lessons taught by the divine Teacher. He is the True Shepherd, and He calls His sheep by name. By the wanderers His voice is heard, saying: “This is the way, walk ye in it” (4T, p. 444, 1881). Daniel March (1816-1909): “There are deep mysteries in the Word of God – un-searchable mysteries in Divine Providence – mysteries past finding out in the plan of redemption… God’s providence is the school in which He is ever setting before us the true aims of life. The term of instruction takes in all our earthly days. None are too young, none are too old to learn, if they only heed the Divine Teacher who “guides with His eye,” and who whisperers to the wanderer, “This is the way – walk ye in it” (Night Scenes in the Bible, pp. 98, 99, 1868). Ellen White (1827-1915): “When Jacob found himself utterly prostrate and in a helpless condition, he poured out his soul to God in an agony of earnestness. The angel of God pleaded to be released, but Jacob would not let go his hold. The stricken man, suffering bodily pain, presented his earnest supplication with the boldness which living faith imparts. “I will not let Thee go,” he said, “except Thou bless me” (4T, p. 444, 1881). Daniel March (1816-1909): “When he found himself utterly prostrate and helpless, and he poured the wrestlings of his soul in strong supplications and tears, then he became a prince in power and he prevailed with God. In the end of the struggle the revealed Angel of the Covenant condescends to entreat his human antagonist and say, “Let me go, for the day breaketh.” And the poor, stricken and suffering man has the boldness to reply, “I will not let thee go except thou bless me” (Night Scenes in the Bible, p. 96, 1868). In the quotation below, you will notice Ellen White’s strong assertion of the divine origin of her testimonies. 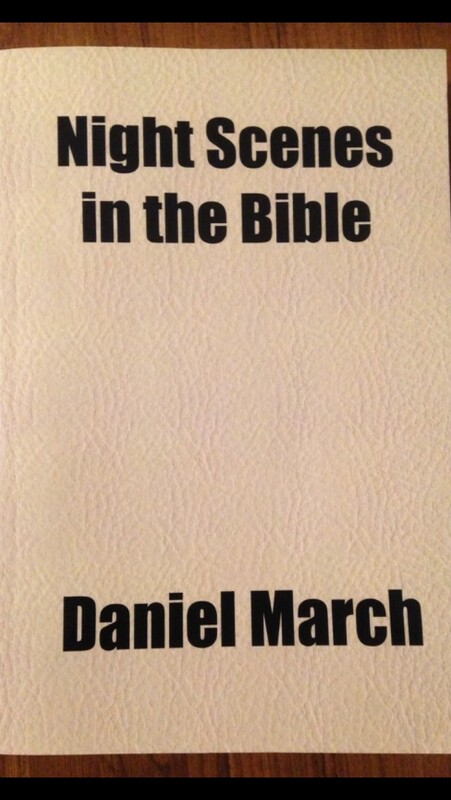 But the truth of the matter is that she copied even this seemingly inspired testimony from Daniel March. Ellen White (1827-1915): “Yet now when I send you a testimony of warning and reproof, many of you declare it to be merely the opinion of Sister White. You have thereby insulted the Spirit of God. You know how the Lord has manifested Himself through the Spirit of prophecy…. You might say that this communication was only a letter. Yes, it was a letter, but prompted by the Spirit of God, to bring before your minds things that had been shown me. In these letters which I write, in the testimonies I bear, I am presenting to you that which the Lord has presented to me. I do not write one article in the paper, expressing merely my own ideas. They are what God has opened before me in vision—the precious rays of light shining from the throne” (1SM, p. 27, 1906). Ellen White: “If you refuse to believe until every shadow of uncertainty and every possibility of doubt is removed, you will never believe. The doubt that demands perfect knowledge will never yield to faith. Faith rests upon evidence, not demonstration. The Lord requires us to obey the voice of duty, when there are other voices all around us urging us to pursue an opposite course. It requires earnest attention from us to distinguish the voice which speaks from God. We must resist and conquer inclination, and obey the voice of conscience without parleying or compromise, lest its promptings cease and will and impulse control” (5T, p. 69, 1882). Daniel March (1816-1909): “We must not defer our obedience till every doubt of uncertainty and every possibility of mistake is removed. The doubt that demands perfect knowledge will never yield to faith, for it rests upon probability, not demonstration. There is no scientific ground of faith, simply because what has become science is taken out of the sphere of faith. We must obey the voice of duty when there are many other voices crying against it, and it requires earnest heed to distinguish the one which speaks for God. We must cherish the impulse of conscience in the moment when it urges us to action, lest it cease from its promptings and we be left to the blind guidance of appetite and passion” (Night Scenes in the Bible, pp. 201, 202, 1868). Ellen White (1827-1915): “He was one hundred and twenty years old when this terrible and startling command came to him, in a vision of the night… Fifty years previous, at the divine command, he had left father and mother, relatives and friends, and had become a pilgrim and a stranger in a land not his own… Over and over again did the burdened soul say, Oh! my son, my son, would to God my life would be accepted in the place of thine…he bowed before God, and prayed as never before for a confirmation of this strange command… Had Isaac chosen to resist his father’s command, he could have done so, for he was grown to manhood… He encouraged the almost nerveless hands of his father to bind the cords which confined him to the altar… The example of Abraham is recorded in sacred history for the benefit of his believing children. This great act of faith teaches the lesson of implicit confidence in God… All that we have is the Lord’s. Our money, our time, talents and ourselves, all belong to him. He has lent them to us, to test and prove us, and to develop what is in our hearts. If we selfishly claim as our own the favors God has graciously entrusted to us, we shall meet with great loss… Our Heavenly Father surrendered his beloved Son to the agonies of the crucifixion. Legions of angels witnessed the humiliation and soul-anguish of the Son of God, but were not permitted to interpose as in the case of Isaac. No voice was heard to stay the sacrifice. God’s dear Son… In the example of Abraham we are taught that nothing we possess is [too] precious to give to God” (The Signs of the Times, April 1, 1875). Daniel March (1816-1909): “Abraham was an hundred and twenty years old when he received strange and startling command to offer his only and son… fifty years before Abraham left the land of his fathers, the love of adventure, the impulse of curiosity, the prospect of a long life yet to be enjoyed… He had left father and mother, kindred and country, at the Divine command…“Oh, my son, my son! Would God I could die for thee! … He bows at the foot of the altar which he had reared unto Jehovah, in an agony of prayer for more light… For he is a full-grown man, twenty- five years of age, and he can easily resist or escape the hand of his father… He consented to be bound… It teaches the great lesson of confidence in the Divine word and surrender to the Divine will… Nothing is too precious for us to give to God… Give Him your money, and you will get more of all that money… Give Him all your time, and a day spent in his service better than a thousand spent in a “pleasurable sin.” Give Him your talents, and your efforts, your toil, and every act of duty done in his name shall receive an exceeding great reward… God actually surrendered his well – beloved Son to the slow and dreadful agony of crucifixion. No voice from heaven commanded to stay the sacrifice when once he had been nailed to the cross. Legions of angels were in waiting, but they were not permitted to interpose for His relief…” (Night Scenes in the Bible, pp. 45-61, 1868). Ellen White (1827-1915): “The agony which he endured during the dark days of that fearful trial was permitted that he might understand from his own experience something of the greatness of the sacrifice made by the infinite God for man’s redemption. No other test could have caused Abraham such torture of soul as did the offering of his son. God gave His Son to a death of agony and shame” (PP, p. 154, 1890). 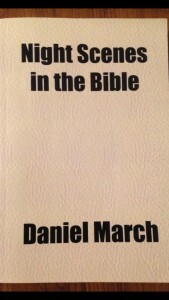 Daniel March (1816-1909): “All the sorrows that wrung the heart of Abraham during the three days of his dark and dreadful trial were imposed on him to help us understand how real, how deep, how unutterable was the self-denial of the infinite God in giving His own Son to death for our salvation. No trial, no mental torture could possibly have been greater to Abraham than that which he bore in obeying the command to sacrifice his son” (Night Scenes in the Bible, p. 61, 1868). Ellen White (1827-1915): “Fairest among the cities of the Jordan Valley was Sodom, set in a plain which was “as the garden of the Lord” in its fertility and beauty. Here the luxuriant vegetation of the tropics flourished. Here was the home of the palm tree, the olive, and the vine; and flowers shed their fragrance throughout the year… Art and commerce contributed to enrich the proud city of the plain. The treasures of the East adorned her palaces, and the caravans of the desert brought their stores of precious things to supply her marts of trade. With little thought or labor, every want of life could be supplied, and the whole year seemed one round of festivity… In the twilight two strangers drew near to the city gate. But there was one man who manifested kindly attention toward the strangers and invited them to his home… Faithfulness or neglect in what are apparently the smallest duties may open the door for life’s richest blessings or its greatest calamities. Lot did not know their true character, but politeness and hospitality were habitual with him;…The strangers had been making inquiry in regard to the character of the city, and Lot had warned them not to venture out of his door that night, when the hooting and jeers of the mob were heard,… We are taught the fearful and solemn lesson that while God’s mercy bears long with the transgressor, there is a limit beyond which men may not go on in sin…Those who hear the gospel invitation calling sinners to repentance, and heed it not, are more guilty before God than were the dwellers in the vale of Siddim” (PP, pp. 156, 158, 159, 162, 165, 1890). Daniel March (1816-1909): “A fair city lies upon the border of a plain that looks like a garden in beauty and fertility… Theirs is the land of the olive and the vine. The flowers blossom through all the year. The air is loaded with perfume… The plains surrounding the city are like the garden of the Lord in fertility… The merchants of the East bring their treasures from afar. The camels and dromedaries of the desert lay down their burdens at her gates… The common people make a holiday of the whole year. Two strangers are seen approaching the city… There was but one man at the gate of Sodom sufficiently attentive to notice the strangers and invite them to his own home… Fidelity in the most common and homely duties of life opens door of the house for the greatest of heavens blessings to come in… They [the idle throng] hoot and jeer at the venerable patriarch when he rises from his seat in the gate to meet the travelers, and bows himself with his face to the ground, and says with Eastern courtesy… And the iniquity of the inhabitants was full… But there is a point beyond which the Divine forbearance cannot go. And they had reached that point when they clamored against Lot… It is the sin of those who hear the gospel call to repentance and heed it not… It is the sin of those who have been many times warned and entreated, and who nevertheless spend their lives in waiting for a more convenient season to repent and turn to God…It shall be more tolerable for Sodom and Gomorrah in the day of judgment than for those who spend their lives in such utter neglect of the great salvation” (Night Scenes in the Bible, pp. 28 – 33, 41, 1868). Ellen White (1827-1915): ““The sun was risen upon the earth when Lot entered into Zoar.” The bright rays of the morning seemed to speak only prosperity and peace to the cities of the plain. The stir of active life began in the streets; men were going their various ways, intent on the business or the pleasures of the day. The sons-in-law of Lot were making merry at the fears and warnings of the weak-minded old man” (PP, p. 162). Daniel March (1816-1909): “The sun is already risen upon the earth and the bright morning promises a beautiful day…The sons-in -law are on their way to his house, to laugh at him for walking in his sleep the night before. The idle and the voluptuous are devising new pleasures for the day” (Night Scenes in the bible, p.37, 1868). Ellen White (1827-1915): “it was not without many misgivings that he retraced the road which he had trodden as a fugitive twenty years before… Again the Lord granted Jacob a token of the divine care. As he traveled southward from Mount Gilead, two hosts of heavenly angels seemed to encompass him behind and before, advancing with his company, as if for their protection. Jacob remembered the vision at Bethel so long before, and his burdened heart grew lighter at this evidence that the divine messengers who had brought him hope and courage at his flight from Canaan were to be the guardians of his return. And he said, “This is God’s host: and he called the name of that place Mahanaim”—“two hosts, or, camps.”… It was in a lonely, mountainous region, the haunt of wild beasts and the lurking place of robbers and murderers… Suddenly a strong hand was laid upon him. He thought that an enemy was seeking his life, and he endeavored to wrest himself from the grasp of his assailant. In the darkness the two struggled for the mastery. Not a word was spoken… The patriarch now discerned the character of his antagonist. He knew that he had been in conflict with a heavenly messenger, and this was why his almost superhuman effort had not gained the victory. It was Christ, “the Angel of the covenant,” who had revealed Himself to Jacob…” (PP, pp. 195-197, 1890). In Jacob’s time, robbery and murder were even more common in all that country then they are now. And then, too, the lion crouched for his prey, and the bear wandered at night on the banks of the Jabbok… Suddenly he feels the grasp of a strong hand upon him, it must be the hand of the enemy. He sprang to his feet, grapples his unknown antagonist, struggles with all his might to fling him to the ground. He does not succeed in overcoming his silent and mysterious assailant,… in which neither party speaks a word, and neither prevails against the other…. Again at Mahanaim he saw the bright battalion of the guardian host attending him before and behind… They were stationed in air to guard him in his perilous journey, with “double camp” before and behind” (Night Scenes in the Bible, pp. 87-101, 1868). Matthew Henry (1662-1714): “Others think it was Michael our prince, the eternal Word, the angel of the covenant, who is indeed the Lord of the angels, who often appeared in a human shape” (Matthew Henry’s Complete Commentary on the Bible, 1710). Matthew Poole (1624–1679): “There wrestled a man with him, an angel, yea, the Angel of the covenant, the Son of God, as it is plain from Genesis 32:28,30 Ho 12:3,4, who did here, as oft elsewhere, assume the shape and body of a man” (Matthew Poole’s English Annotations on the Holy Bible, 1685). Ellen White (1827-1915): “Jesus had spent the entire night in prayer, and he came down to the beach in the early morning to look for his disciples who were fishing near the shore. He could not long remain undisturbed by the people. As soon as it was known that Christ was by the sea-side, the multitude flocked to him. Their numbers increased so that he was pressed upon all sides. As he stood teaching them, the crowd became so dense that he stepped into a boat, and pulling out a little from the shore, gave the people a better opportunity to see and hear him, as he continued his discourse. ….The Saviour, seated in the rude boat of a fisherman, taught the words of life to the listening people upon the beach. He was patient with those who were laboring under temptation, tender and kind to the sorrowing and disheartened… What a scene was this for angels to contemplate! Their glorious Commander, sitting in a fisherman’s boat,… and preaching salvation to the listening crowd that are pressing down to the water’s edge! He who was the honored of Heaven. teaches his grand doctrine of deliverance in the open air to the common crowd… Yet he could have no more magnificent scene for his labors. The lake, the mountains, the spreading fields, the sunlight flooding the earth, all furnish subjects by which his lessons can be impressed upon the human mind. In plain sight are the sowers and the reapers, side by side, the one casting the seed, and the other harvesting the early grain. The fruitful valleys, and the hill sides are clothed in beauty. The barren rocks are seen upon the beach, and the birds make the air vocal with their music. The sea-fowls skim upon the surface of the water. Jesus takes this opportunity to draw lessons from nature that will sink into the minds of his listeners. He employs the scenery about him to illustrate his doctrine,… Sitting thus, and looking upon the animated scene before him, Jesus uttered the parable that has been handed down to us through the ages, as pure and beautiful today in its unadorned simplicity as when it was given that morning on the Sea of Galilee more than eighteen hundred years ago” (2SP, 232, 233, 1877). Daniel March (1816-1909): “The still surface of the lake like a dark mirror of burnished steel encased in its high frame – work of hills, receiving and reflecting the rapid morning. The birds of the air break the silence first with solitary note, and then swelling with chorus of voices that fills the whole vault of heaven… It is Jesus himself. He has risen before the day, and gone down to the lake – side to meditation and prayer… Jesus is no longer alone… The multitudes who had followed Jesus… have learned his retreat, and are hurrying down to the beach… The surging crowd gather closer and closer upon Jesus until he is pressed down to the water’s edge. At last he is compelled to request one of the fishermen to receive him into his boat… And so he sits in the bow of the unsteady boat, teaching the multitude that stand or recline and listeners on the shore. Calm, patient, condescending, he bears with their rudeness, he pities their ignorance, he speaks to them as man never spake. Oh! What a scene is this. The Son of god, the king of heaven, the Sovereign of all worlds comes upon a mission of mercy … He sits there upon the swaying seat of a fisherman’s boat, talking to the rude and noisy crowd on the shore, when he might sit upon the throne of heaven and receive the homage of archangels…. At this season of the year, in the torpical climate on the depressed level around the lake, the sower and the reaper may be seen scattering different kinds of grain side by side. The divine teacher employs these natural similitudes in setting forth the reception of his word in the human heart… It is now midsummer, and the work of sowing and reaping is going on at the same time… At the same time, flocks of birds, sporting on the wing and in the water, make the morning air musical with their happy voices and beat the waves into foam with their fluttering wings” (Walks and Homes of Jesus, pp. 75-81, 114, 1866). Ellen White (1827-1915): “The groves of Eden were God’s first temples, from which ascended purest worship to the Creator. The sorrowing exiles from Paradise could never forget that happy home. The waving trees and sheltering groves had for them a peculiar charm; for they reminded them of Eden and the joyful converse which they had once enjoyed with God and angels. And as they listened to the murmur of the wind among the leaves it almost seemed that they could again distinguish the sound of that voice that was heard in the garden in the cool of the day. The oak and the palm-tree, the drooping willow and the fragrant cedar, the olive and the cypress, were sacred to our first parents. Their verdant branches, spreading abroad and reaching upward to heaven, seemed to them to be praising their Creator” (ST, February 27, 1879). Daniel March (1816-1909): “Paradise itself signifies a park of trees… The groves of Eden were the first temple, in which the new – created pair offered a pure and acceptable worship to Him… They heard the voice of the Lord God mingling with the murmur of the foliage… To them the trembling of the leaves was the sign that they were trodden by the invisible steps of heavenly messengers coming to talk to with them… And when they heard their names called in the cool of the day, it seemed to them that the divine voice had spoken from the sanctuary of the green boughs and the pleasant trees that adorned their garden – home” (Our Father’s House, pp. 96, 97, 1869). Ellen White (1827-1915): “The eagle of the Alps is sometimes beaten down by the tempest into the narrow defiles of the mountains. Angry storm-clouds shut in this mighty bird of the forest, their dense, dark masses separating her from the sunny heights where she has built her nest. For a time her efforts to escape seem fruitless. She dashes to and fro, beating the air with her strong wings, and waking the echoes of the mountains with her cries. At length, with a scream of triumph, she darts upward, and, piercing the clouds, she is once more in the clear sunlight, with the darkness and tempest far beneath. Ever thus, by mighty efforts, have God’s chosen servants urged their way upward, breasting opposition, reproach, and persecution, in their conflicts with principalities and powers, and spiritual wickedness in high places” (ST, July 26, 1883; Ed, p. 118, 1903). Daniel March (1816-1909): “The eagle of the Alps is sometimes beaten down by the tempest into the narrow defiles of the mountains. The clouds in black and angry masses sweep between the mighty bird and the sunny heights where she builds her nest and basks in the full day. For a while she dashes to and fro, buffeting the storm with her strong wings and waking the echoes of the mountains with her wild cry… At length she dashes upward with a scream of triumph into the midst of the black clouds, in a moment she is above them in the calm sunshine, with the darkness and tempest all beneath… So by a firm decision and a mighty effort mist we rise above all the clouds of doubt and fear to the serene heights of faith and peace in God. So through darkness of trouble and conflict and death must we pass into heaven’s eternal day” (Our Father’s House, pp. 254, 255. 1869). Ellen White (1827-1915): “You are pressed with urgent cares, burdens, and duties; but the greater the pressure upon you, and the heavier the burdens you have to bear, the greater your need of divine aid. Jesus will be your helper you need constantly the light of life to lighten your own pathway, and then its divine rays will reflect upon others. The work of God is a perfect whole, because perfect in all its parts. It is the conscientious attention to what the world calls little things that makes the great beauty and success of life. Little deeds of charity, little words of kindness, little acts of self-denial, a wise improvement of little opportunities, a diligent cultivation of little talents, make great men in God’s sight. If those little things be faithfully attended to, if these graces be in you, and abound, they will make you perfect in every good work” (4T, p. 543, 1881). Daniel March (1816-1909): “Depend on it, my friend, it is minute and conscientious attention to what the world calls little things that makes the great beauty and success of life. Little deeds of charity, little words of kindness, little acts of self-denial, little moments of diligence; a careful watch against little sins, a grateful use of little blessings, a wise improvement of little opportunities, a diligent cultivation of little talents, patient continuance in well-doing under little encouragement, – these things make men great in the sight of God; if these things be in you and abound, they will bring the knowledge and enjoyment of everything else” (Our Father’s House, p. 191, 1869).